The best way to prevent whooping cough (pertussis) is through vaccination. The DTaP vaccine is available for children younger than 7 years, and is sometimes given as part of other combination vaccines. The Tdap booster vaccine is available for people 10 years and older. Both vaccines protect against whooping cough, tetanus and diphtheria. California law requires all students entering seventh grade to have had the whooping cough booster before starting school this fall. There is no grace period for students who do not meet this requirement. Contra Costa Health Centers: Established patients can call 1-800-495-8885 to schedule an appointment. 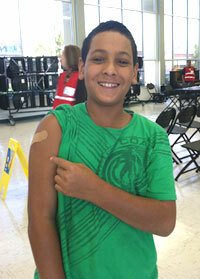 Community clinics offer whooping cough vaccine. Call your clinic for details. People with private health insurance, including Kaiser, can contact their regular provider to get vaccinated. Most pharmacies have whooping cough vaccine. Check store for details.